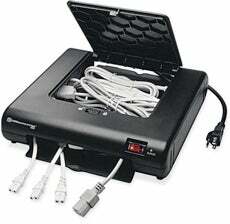 Chalk up this device as another convenient way to get rid of all of those cords under and on top of your desk. This box has 10 power outlets inside and plenty of room to stack all of the spare cords. Feed the power end out the front and juice up all of those devices. Despite what the picture shows, the box is only available in beige and goes for $55.